Mokas come in a variety of sizes. The moka (officially known as Moka Express) was invented in 1933 by Alfonso Bialetti, an engineer from Piemonte. He began to manufacture and sell them at his local market selling 70,000 of them before the advent of the Second World War. 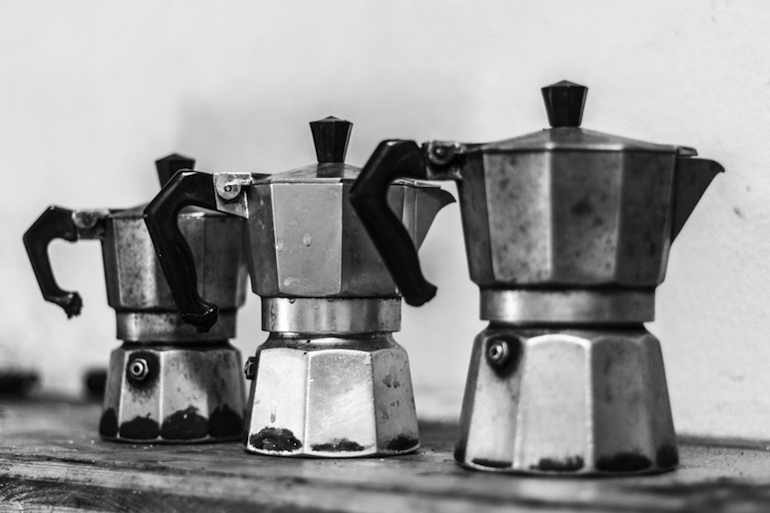 Production stopped during the war, since aluminium was needed for other purposes, but in 1946 Alfonso’s son Renato started manufacturing and marketing the moka all over Italy, and the rest as they say, is coffee history. Mokas also come in a variety of colours. If Alfonso Bialetti was a design genius, Renato was a marketing genius. In 1958 he teamed up with his friend, cartoonist Paul Campani to produce the logo which has meant Bialetti ever since: the omino coi baffi (the little man with the moustache). Obviously based on Renato, who sported the same over-the-top moustache, the omino appeared in a series of infomercials on Carosello—a ten-minute advertising slot on Italian TV—to instant success. A moka in the shape of the omini coi baffi. How do you make the perfect moka coffee? So without further ado, how do you make the perfect coffee using a moka? First of all, it’s important to choose a good quality coffee and one that has been ground especially for use in a moka. These are widely available and brand names such as Illy, Lavazza, and Segafredo come to mind. Many coffee roasteries will also grind the beans for you, I like to buy my coffee from Torrefazione Cannaregio in Venice. Just make sure you tell them that you want it for use in a moka. A Bialetti moka with the omino coi baffi logo. The moka itself is in three pieces: the water reservoir, the coffee container, and the pot. You will notice that about three quarters of the way up the water reservoir, there’s a valve. Identify it as it’s very important. The three pars of the moka. Put cold water in the water reservoir up to the level of the valve. Do not cover the valve with water. The water should reach just blow the valve. Gently spoon your coffee into the coffee container. Do not press it down with the spoon. It should sit in the container under its own weight. If you want your coffee to be regular strength, fill it to the top of the container. If you want your coffee to be strong, allow a heap of coffee to stick up out of the container, but again, do not press it down. When you put the coffee pot on it will do that for you. Screw the coffee pot back on top of the water reservoir and then place on the stove and turn on the gas. When the coffee has started entering the coffee pot at full flow—you will know when as the moka starts making a loud noise—turn the gas down to the lowest possible setting and when the pot is about half full turn it off completely. If you leave the gas on, you run the risk of burning the coffee and turn it into bitter, ‘over-extracted rocket fuel’. The resulting coffee will be at about 92°C (about 197°F). When the coffee has finished entering the coffee pot, mix it in the pot with a spoon, and serve in small espresso cups. The coffee will be strong, so you don’t want to drink too much. Mokas generally tell you how many cups they will make, so you can use this as a portion guide. As my friend Janys, who runs Creative Retreats in Italy, reminded me, Italian baristas always warm the cups before serving coffee. You can do this at home by filling the cups with boiling water while the coffee is brewing and then throwing it away before serving. Also, never wash your moka with detergent, only with hot water. The detergent can react with the aluminium and ruin the flavour of coffees to come. It’s recently been announced the the Bialetti company is in financial trouble. Let’s hope that they are able to weather the storm and that the omino con i baffi continues to grace the next generation of Italian kitchens. If you don’t have a Moka Express, why not go out and buy one and help save an Italian institution? I finally bought a moka about a year ago after using a French press for years. What a difference! I was intimidated at first and did look online for how to use it. I’ve been a regular visitor to Italy for years and I find over time my expectations for the quality of my coffee has gone up as I come back after having excellent coffee to be disappointed with what I had been drinking at home in the US. Love Torrefazione Cannaregio as well. I’ll be a week in Cannaregio this January and hope it is a quick enough walk from the apartment I’ve rented to be my morning cappuccino stop. It’s quite a different from a French press, no? Interestingly, when I lived in France, no-one had heard of a French press. They all used filter coffee machines and looked incredulously at me when I said they were French. You know that Torrefazione Cannaregio has moved to a new location? It’s now on Fondamenta dei Ormesini. Not far from the original location but much better canal-side premises. Very close to the ghetto. Morning cappuccino at TC sounds just the thing in a cold January. Yes, I’m aware of their move although only after walking by their old location this past September and thinking they had closed. I didn’t look online until after I was home to find that they had moved. I normally stay in Dorsoduro and would occasionally stop in for afternoon coffee (or to pick up some of their interesting chocolate pasta). The January trip will be with my niece so I needed a bigger apartment and it’s my first time staying in Cannaregio in probably 20 years. I’m also very interested in the Mukka Express – I had never heard of this. I do prefer my coffee with some amount of milk. I’m not sure that the make the Mukka Express any more. I bought mine almost 20 years ago. I didn’t see one in the Bialetti shop here when I visited the other day. I’m another who loves my Bialetti moka. I hope the company survives. Oh yes, I’ve not tried those. Sounds like it’s not worth it as I have my trusty moka. Interesting though. I have a Mukka which I bought many years ago on a trip to Rome. It’s black and white, like a cow, right? I’d love to see some of your moka sketches. Are there any on your blog? That’s it! The top is cow patterned There are fotos of my moka Lino cut and Christmas card on instagram. I can recommend the electrical version of the Bialetti moka – almost completely “idiot proof”. I’ve seen it and often wondered how well it worked. Thanks for letting me know.